Absolut einer der besten Hostels, in denen ich bisher übernachtet habe - wenn nicht sogar das beste. Es gibt eigentlich keine Kritikpunkte. Schöne, saubere Zimmer mit großen Betten im Dorm. Gute Lage und freundliche Mitarbeiter. Wir haben uns sehr wohl gefühlt. Great hostel. Really big and comfy beds, good wifi, TV in the dorm with possibility to watch Netflix, well located in the center of the city close to bars, restaurants and the central park. Breakfast is not included and costs 3$, nothing special but it's good. Not the cheapest hostel, but worth the price. Only negative point, there are no lockers in the room. 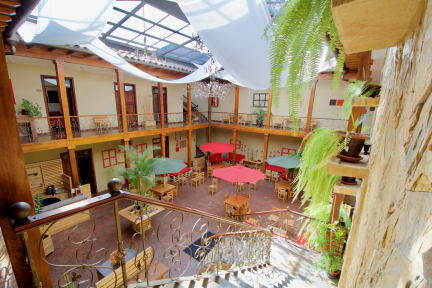 Really nice hostel, huge beds, nice owners, good breakfast, really clean. Everything is super good! The only thing missing are lockers. But it is really familiar and safe so I wasn't scared about my stuff. Nice beds and very helpful staff. Feels like you're in a hotel more so than a hostal. A very nice and clean hostel that actually feels more like a hotel! The beds are big and super comfy, the staff is friendly and willing to help with any information you need, the spacious common area is very luminous and pretty and the wifi works good in all places! Only downside, the hostel is dead from like 9 when staff leaves and turns off the lights. You can obviously stay longer and turn it off yourself but it makes the atmosphere a little uncomfortable silent.